This gluten-free & vegan Double Blue Peppermint Moon Milk makes for one soothing & delicious antioxidant-rich brew perfect for those stressful days and sleepless nights . . . Some of you may have caught on to my love of colorful beverages by now . . . This Double Blue Peppermint Moon Milk is no exception! 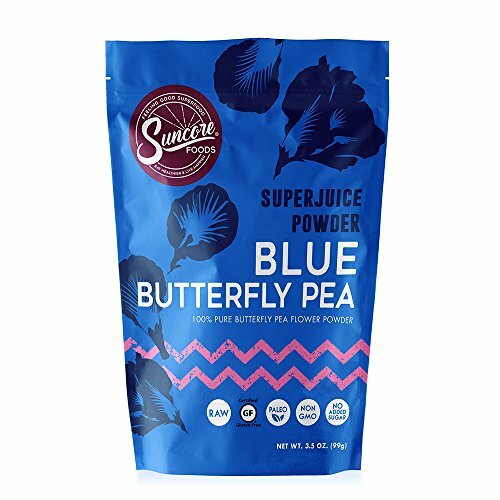 This delicious and vibrant brew was wholly inspired by my first voyage into Blue Butterfly Pea Flower Powder land (thank you, Suncore Foods!). Holy moly is this stuff amazing . . .
Just look at that beautiful color! And the best part? Blue Butterfly Pea Flowers (Clitoria ternatea) are packed with antioxidants, stress-relieving properties, and anti-inflammatory effects. What's not to love? I truly hope you enjoy my take on this nighttime beverage with its roots in Ayurveda; and give the amazing Blue Butterfly Pea Flower Powder a spin yourself! 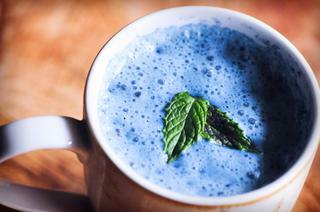 A soothing, antioxidant-rich, delicious, and comforting Double Blue Peppermint Moon Milk. A relaxing gluten-free vegan brew for stressful days and sleepless nights. To a blender add all of the above ingredients sans maple syrup and mint leaves.Blend until smooth and uniform.Optionally strain mixture through a fine mesh strainer or nut milk bag. (I do not do this as I don't mind any larger bits of berries or seeds settling in the bottom of my cup)Heat your moon milk mixture over low-medium heat on the stove-top. Stir in maple syrup or sweetener of choice. Whisk gently until foamy and heated throughout.Pour into mug(s) and optionally garnish with fresh mint leaves.Enjoy!